Since the explosive success of the 2016 film adaptation of DC Comic’s antihero team “Suicide Squad”, characters like Joker and Harley Quinn from the said squad has exploded in popularity. Prior to the release of the film, only the comic buffs know these characters since the franchise is one of the outlying comic series of DC Comics. Harley Quinn, in particular, has been the main focus of this sudden rise to fame of the once unknown antihero team. Margot Robbie’s portrayal of the character raise her to the prominence she has today. 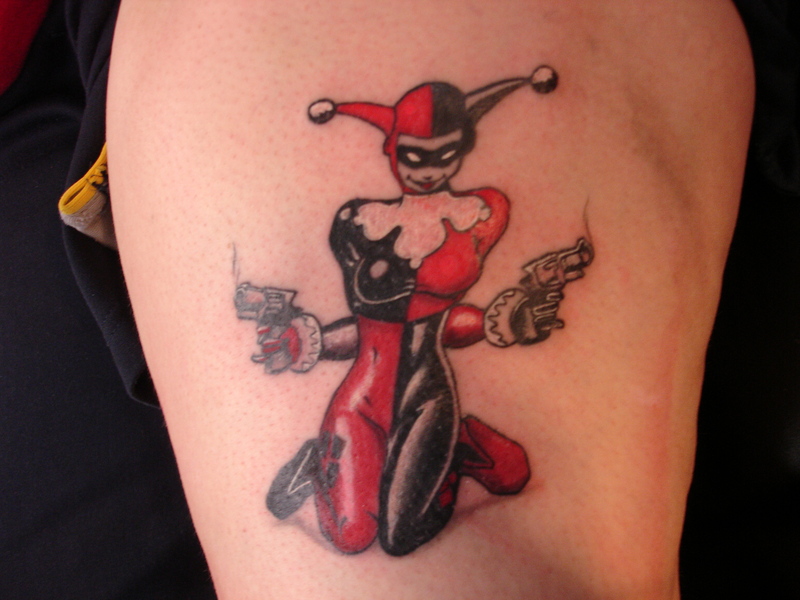 Hence, the rise in popularity of Harley Quinn tattoo designs in the body art industry. 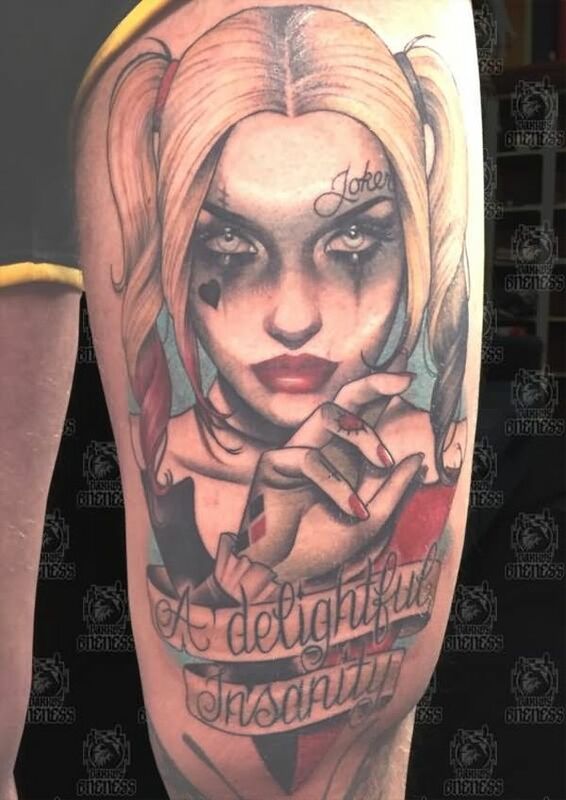 In this article, we will be discussing the background and rise to fame of Harley Quinn, the perfect body placement for this tattoo design, and the various design ideas we have seen for Harley Quinn tattoos. 1 Who Is Harley Quinn? Harley Quinn is a fictional supervillain appearing in comic books published by DC Comics. She is depicted as the love interest and often the love interest of Joker with both appearing in the Batman comic series several times. Her name, Harley Quinn, is a play on the name “Harlequin”, a character pulled out from commedia dell’arte. Dr. Harleen Quinzel, Ph.D. (Her real name) was a psychiatric intern at Arkham Asylum. A model student, in addition to receiving high grades in college, she was also a dedicated gymnast, winning a scholarship to Gotham City University. While researching the lunatics at Arkham, she became fascinated with one particular inmate. Ambitiously volunteering to analyze him, she pleaded with the doctors at Arkham for three months before she could treat him. After he gained her sympathy during their sessions, he seduced her, causing her to fall madly in love with him. After helping him escape from the asylum more than once, Harleen was suspected by the authorities, who revoked her license and placed her in her own cell. During an earthquake in Gotham City, she fled and became Harley Quinn, the sidekick of the Clown Prince of Crime himself. Undoubtedly, Margot Robbie‘s portrayal of the character in Suicide Squad has a large contribution to Harley Quinn’s rise to fame. Most fans of the comics can agree to the fact that Margot was perfectly picked for the cole. This can be proven by the reviews of the film. Suicide Squad received mixed to negative reviews upon release but the majority of the critics agreed that Margot Robbie’s depiction of Harley Quinn was spot on and wished to see the character again in other films under the DC Universe. 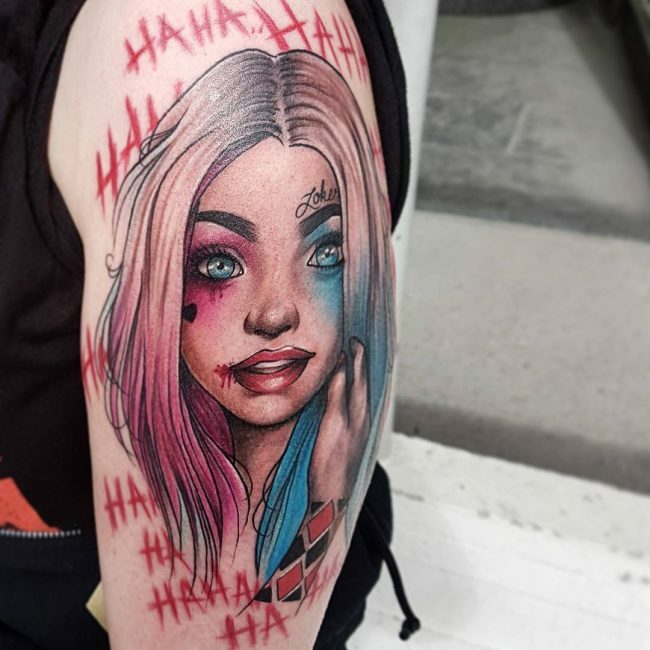 Having a Harley Quinn tattoo is now considered cool since the screen release of Suicide Squad and everyone who will have this tattoo design would probably like this tattoo be visible to all. The advisable body placement for this tattoo design would be the limbs (i.e. sleeves, arms, thighs, and legs area) as they are almost always visible and have large surface areas that would be perfect for an intricate tattoo such as this. 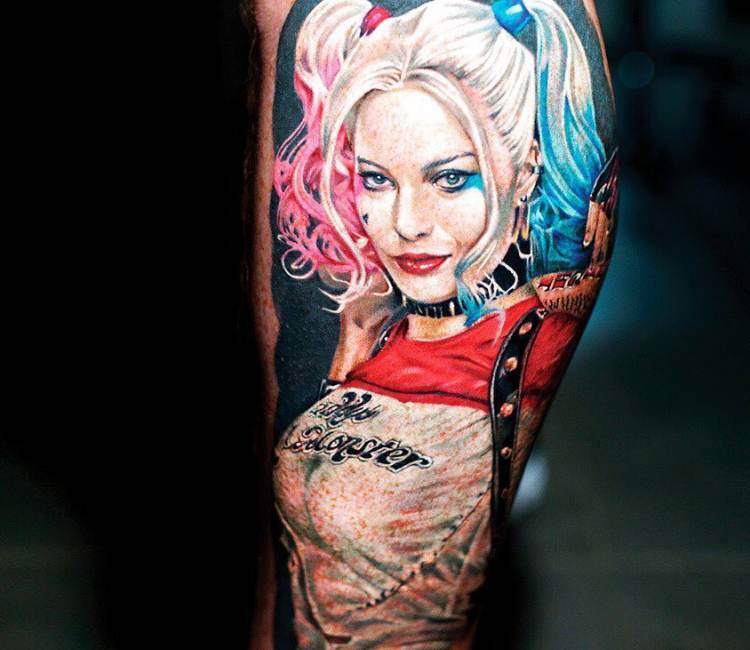 Since Harley Quinn tattoo designs only gained traction recently, most of the depictions of the character has been related to Margot Robbie’s character. 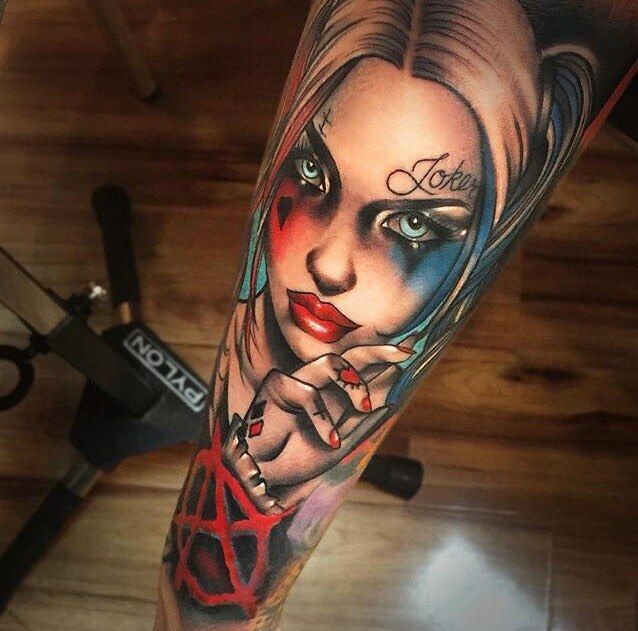 Most Harley Quinn tattoos are watercolor ink based since the character is often seen with colorful detailing such as blue and pink hair. 1. 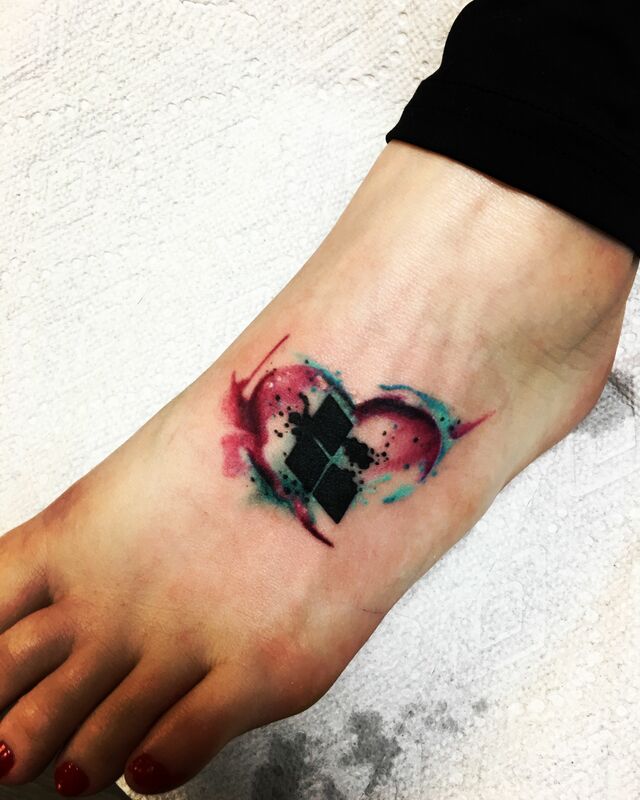 A small foot tattoo of Harley Quinn’s symbol with an abstract heart as the background. 2. 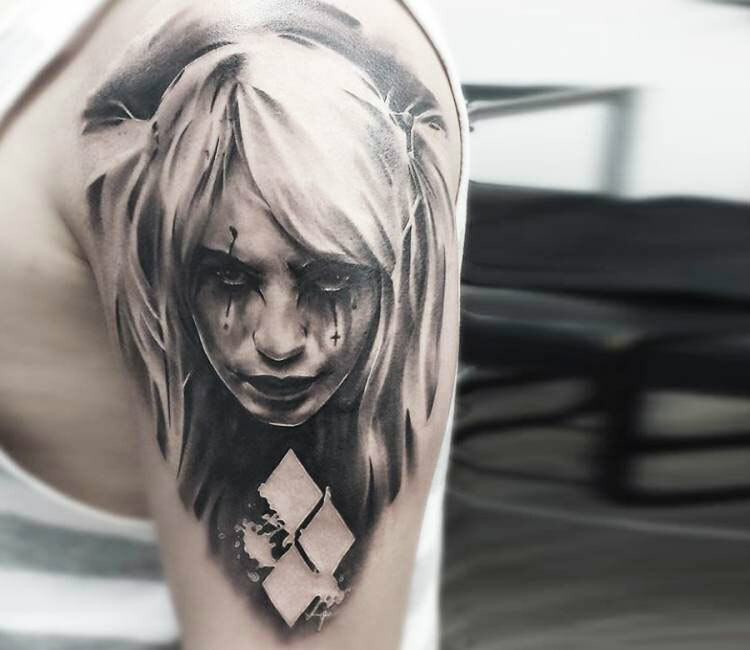 A highly detailed monochromatic arm tattoo of Harley Quinn. 3. 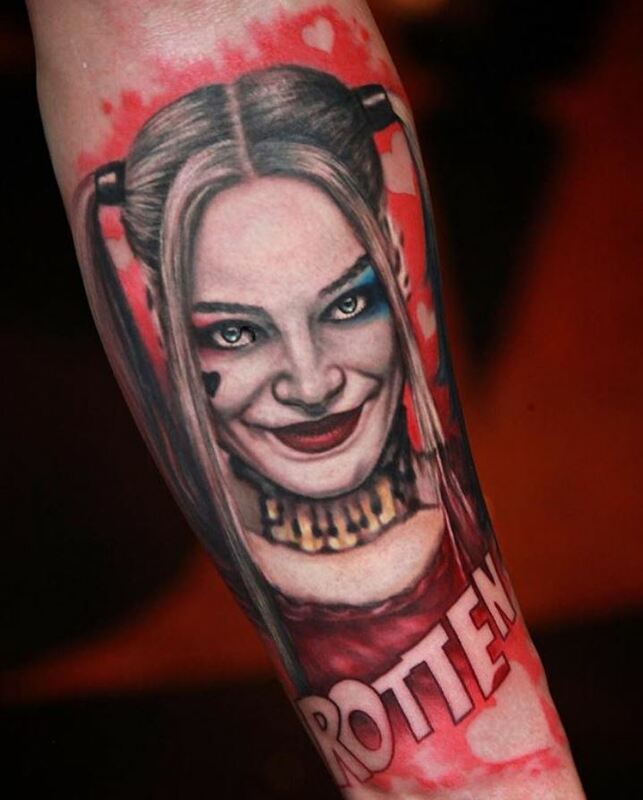 A realistic arm tattoo of Harley Quinn from Suicide Squad. 4. 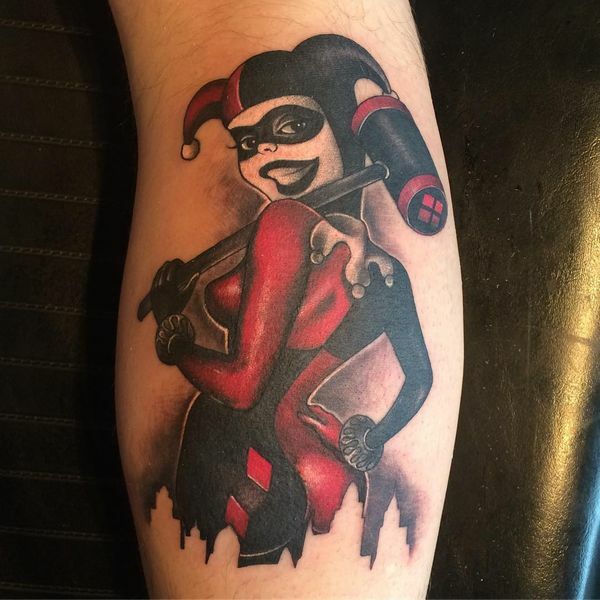 A colored arm tattoo of Harley Quinn on with red background. 5. 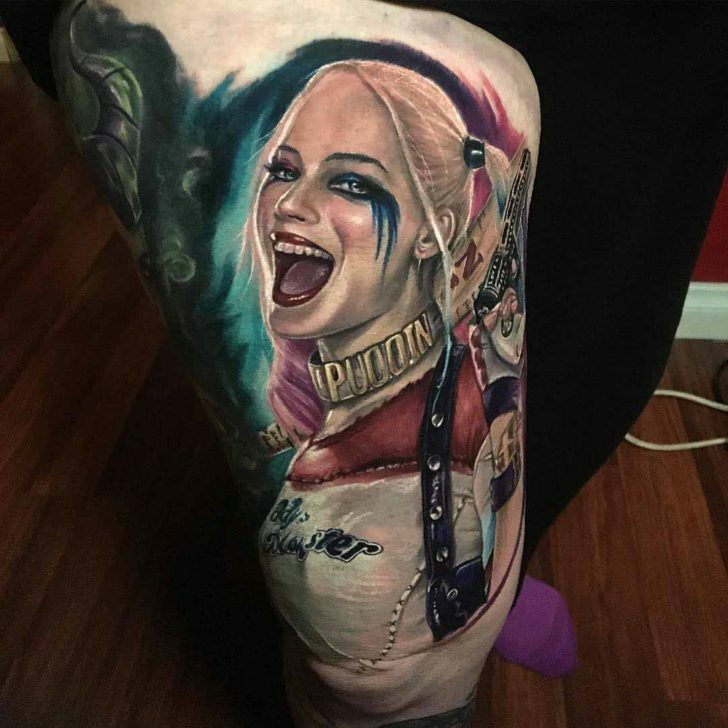 An intricate realistic watercolor leg tattoo of Harley Quinn with pink and blue hair. 6. 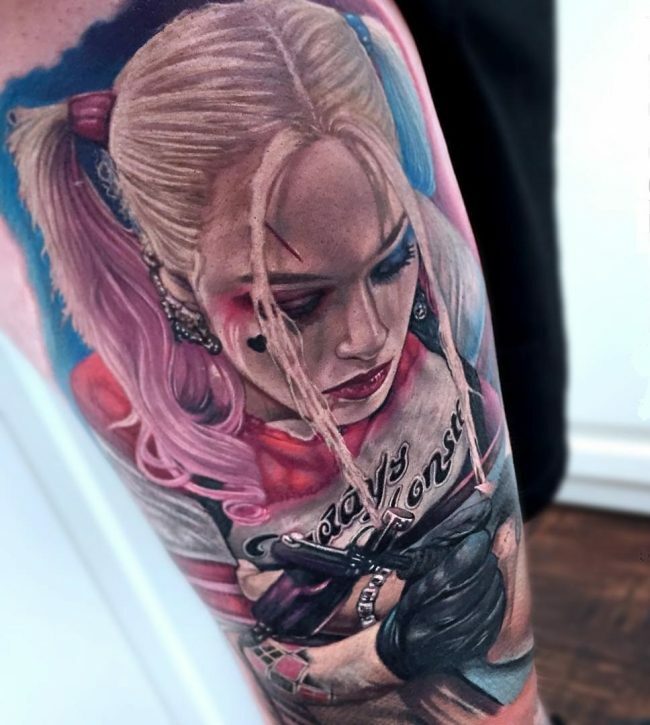 A colored sleeve tattoo of Harley Quinn. 7. 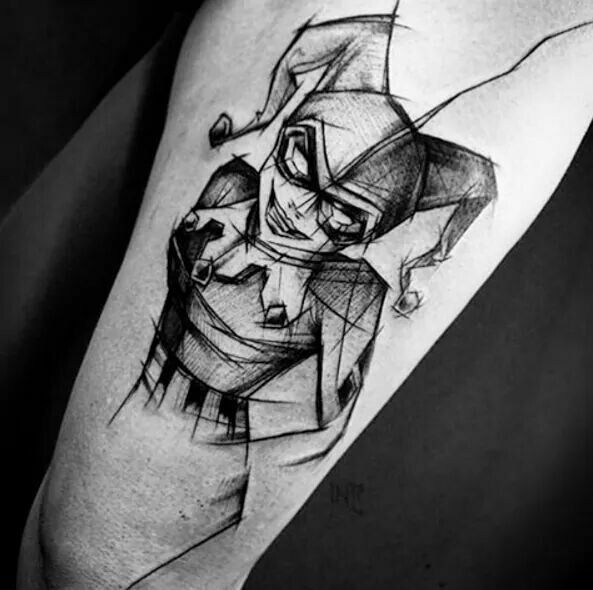 A leg tattoo of Harley Quinn’s face inscribed in her symbol. 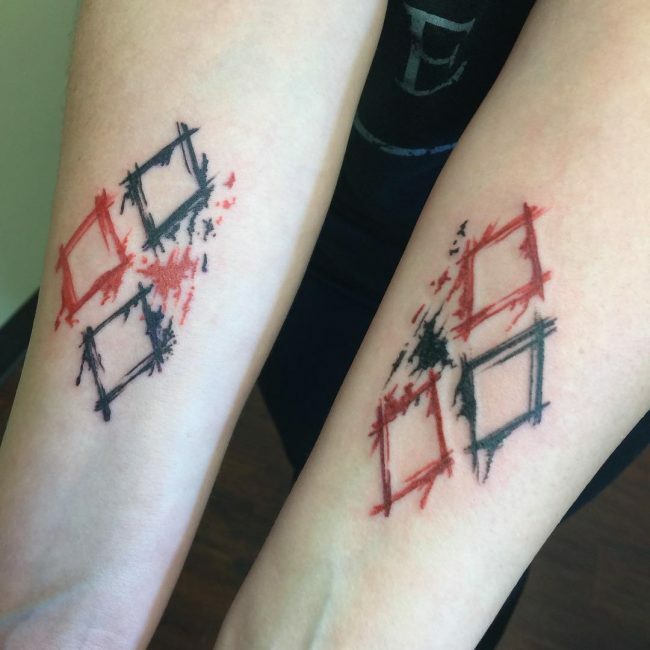 8. two arm tattoos of Harley Quinn’s symbol. 9. 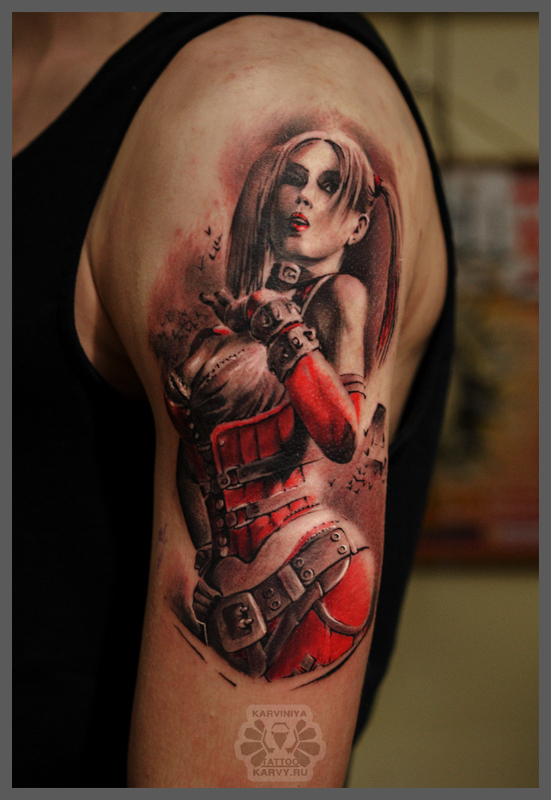 A neo noir-inspired sleeve tattoo of Harley Quinn with red accent color. 10. A sleeve tattoo of Harley Quinn with steampunk background. 11. A watercolor arm tattoo of Harley Quinn in red and black clothes. 12. A sketch-like arm tattoo of Harley Quinn as seen in the comics. 13. A watercolor sleeve tattoo of Harley Quinn. 14. 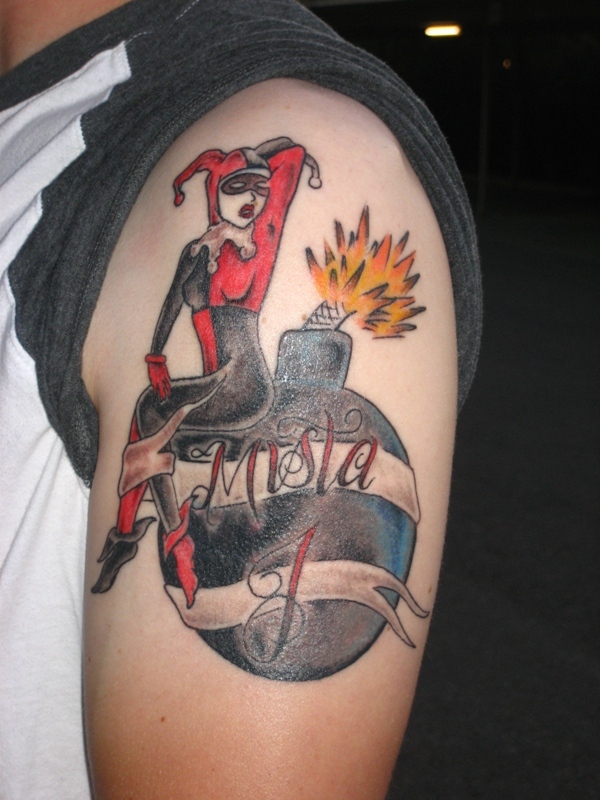 A colored sleeve tattoo of Harley Quinn from the comics sitting on a bomb. 15. 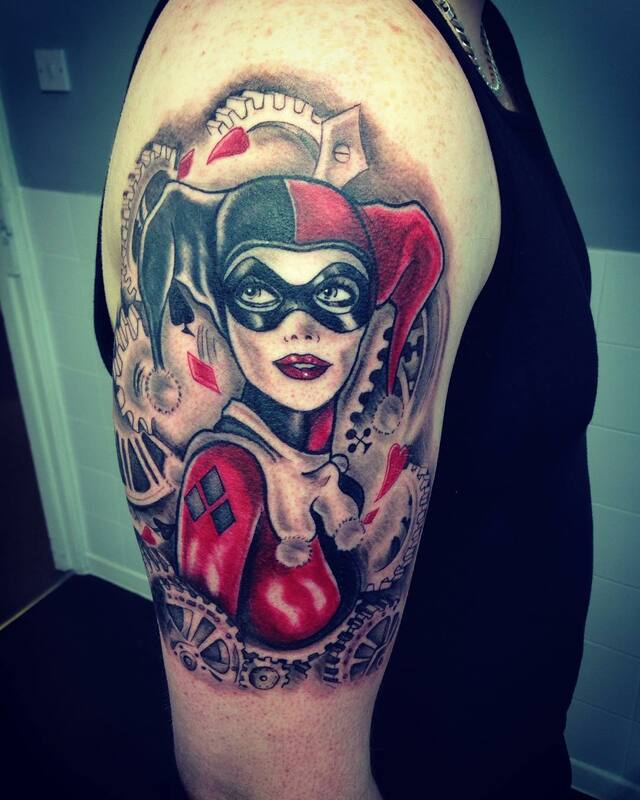 A black ink sleeve tattoo of Harley Quinn. 16. 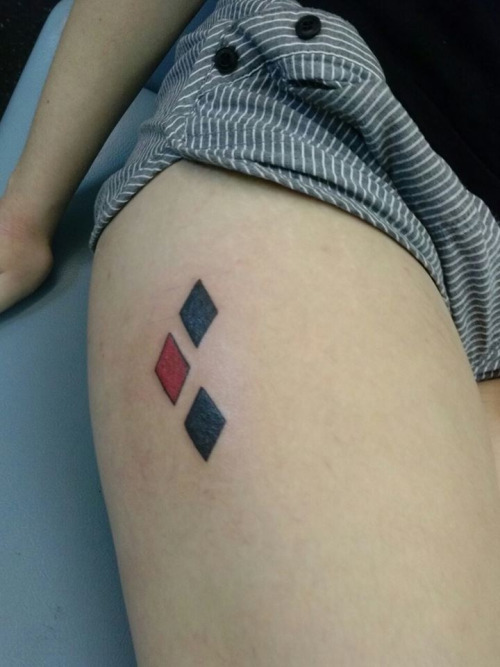 The three diamonds symbol of Harley Quinn inked as a thigh tattoo. 17. 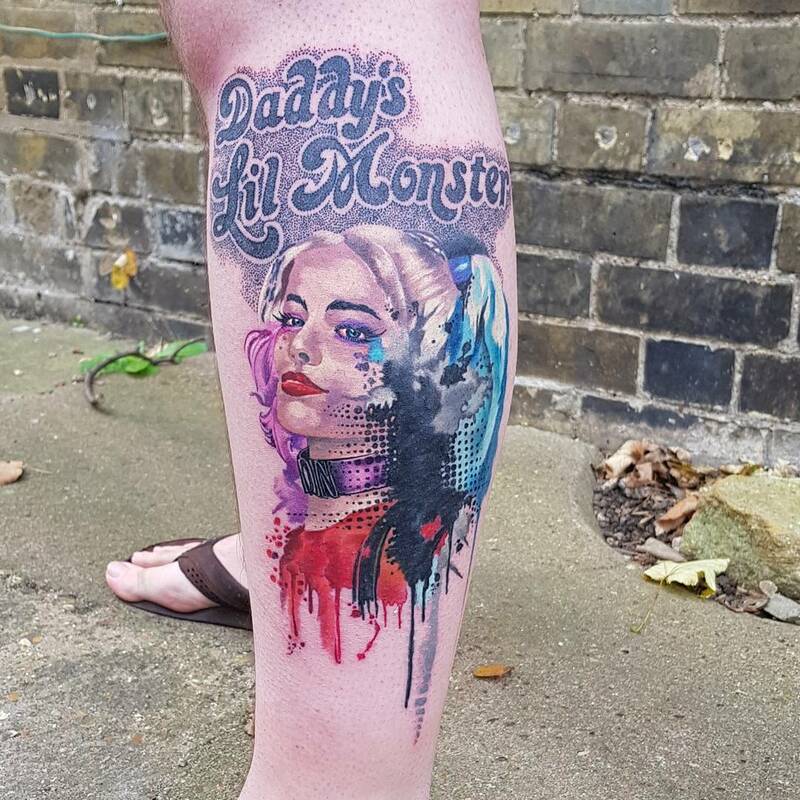 A highly detailed leg tattoo of Harley Quinn from Suicide Squad. 18. 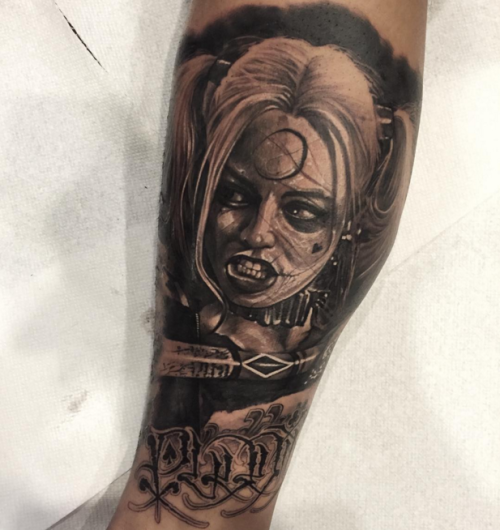 A leg tattoo of Harley Quinn as seen from Suicide Squad with street style embellishment. 19. 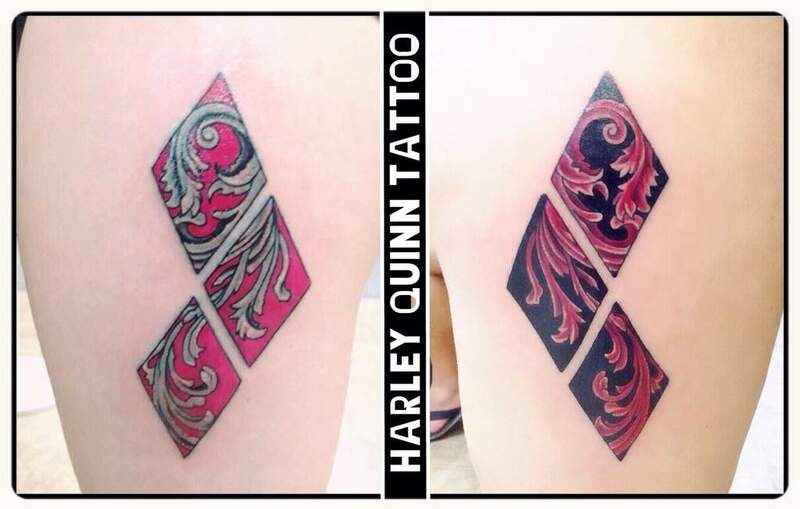 A thigh tattoo of Harley Quinn’s symbol with heraldic vines inside. 20. 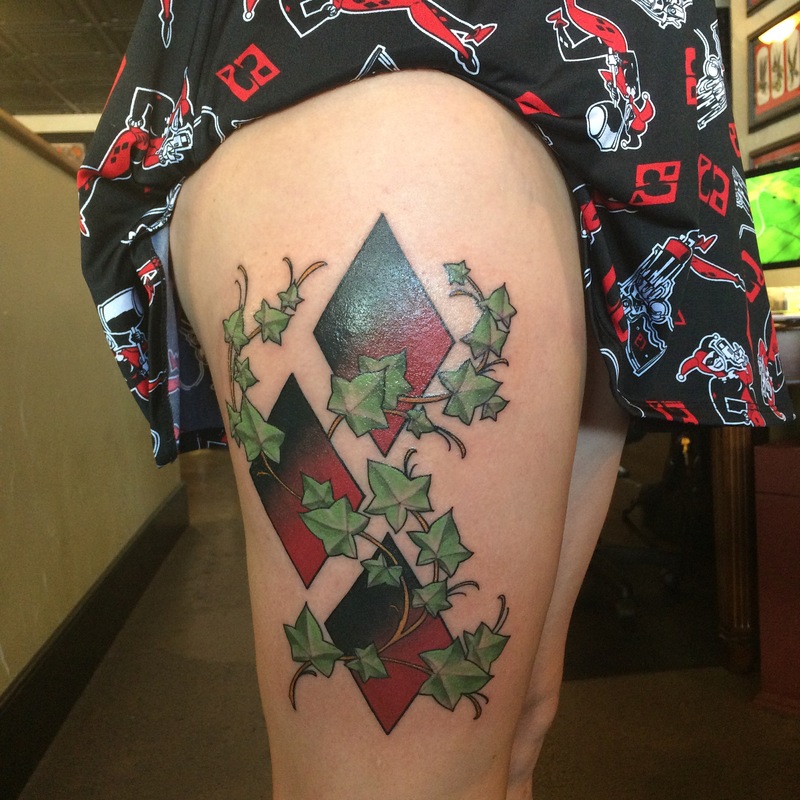 A medium-sized tattoo on the thigh of Harley Quinn’s symbol with vines. 21. 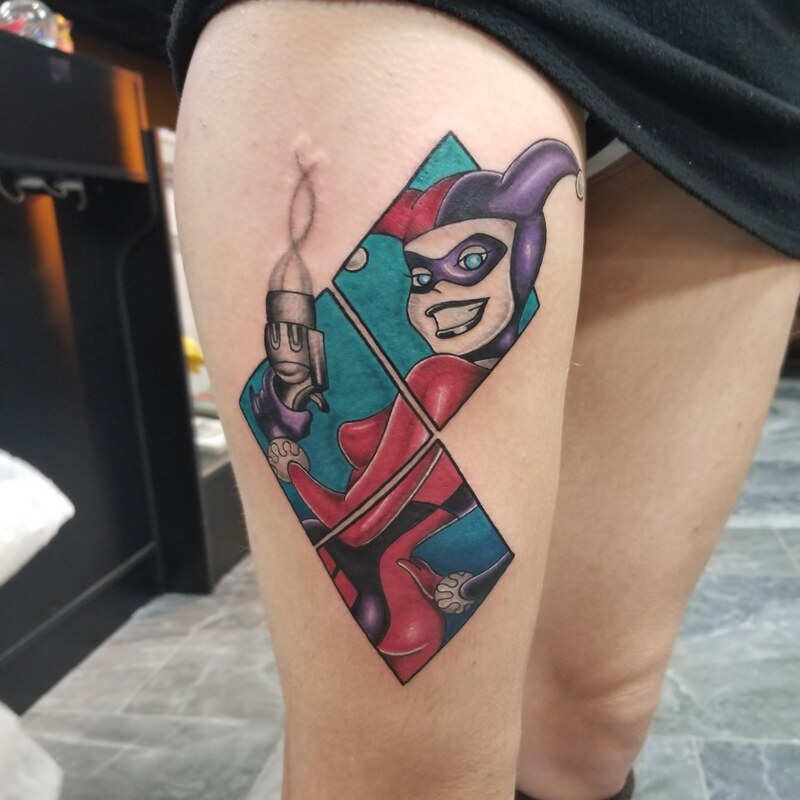 An intricate tattoo of Harley Quinn on the thigh. 22. 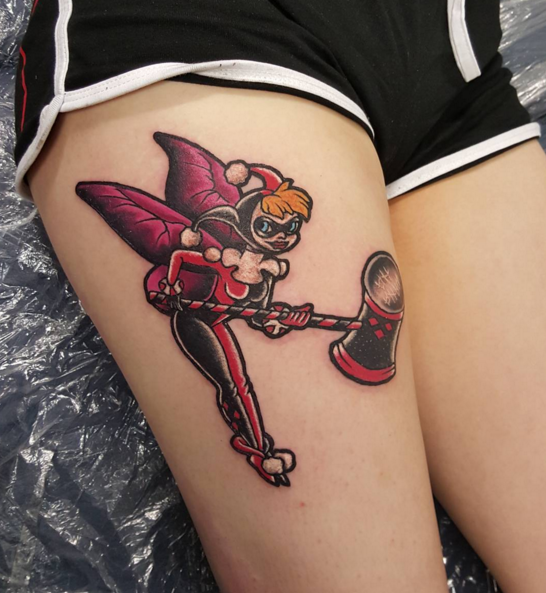 A tattoo of Harley Quinn as seen in the comics dressed as a fairy. 23. 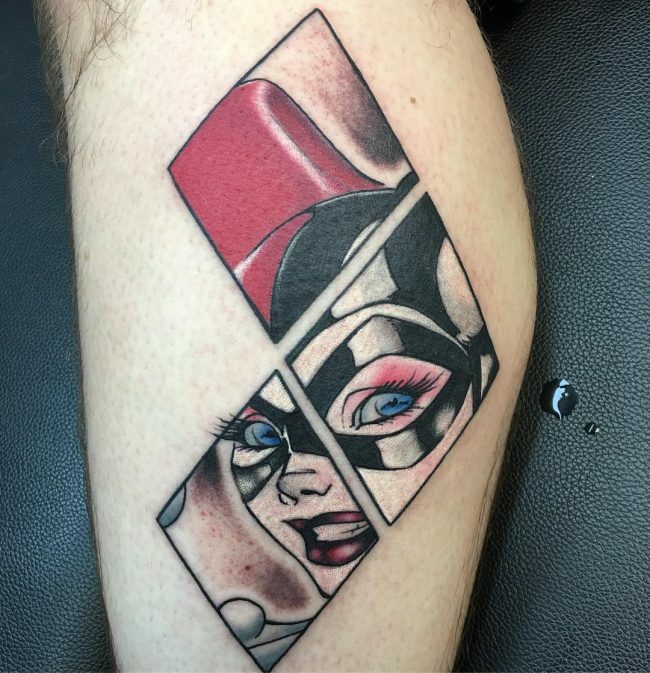 A thigh tattoo of Harley Quinn from the comics inside the three diamonds symbols. 24. 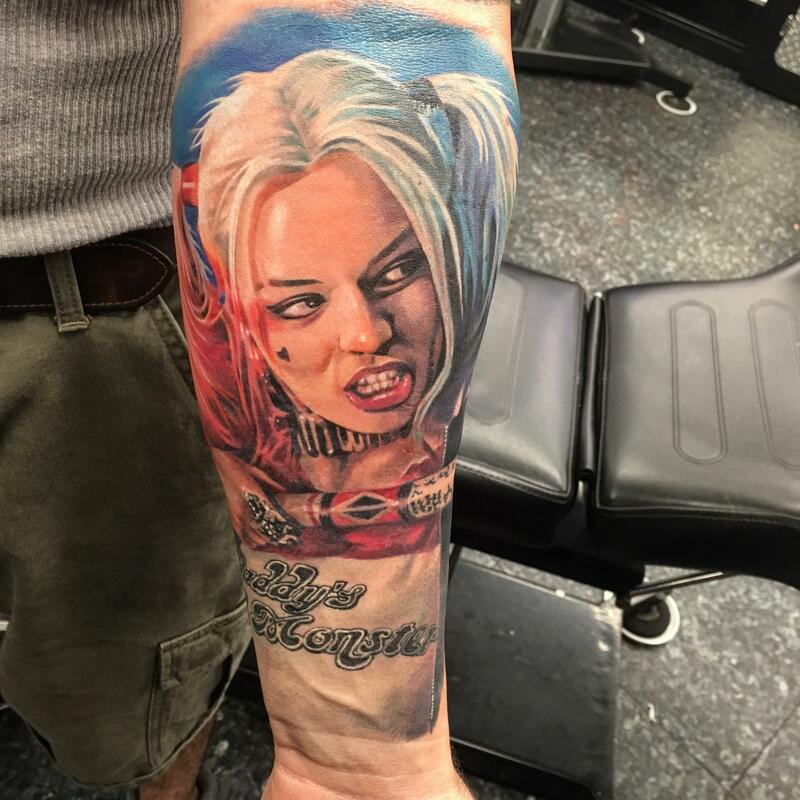 A watercolor tattoo of Harley Quinn as depicted by Margot Robbie in Suicide Squad’s trailer. 25. 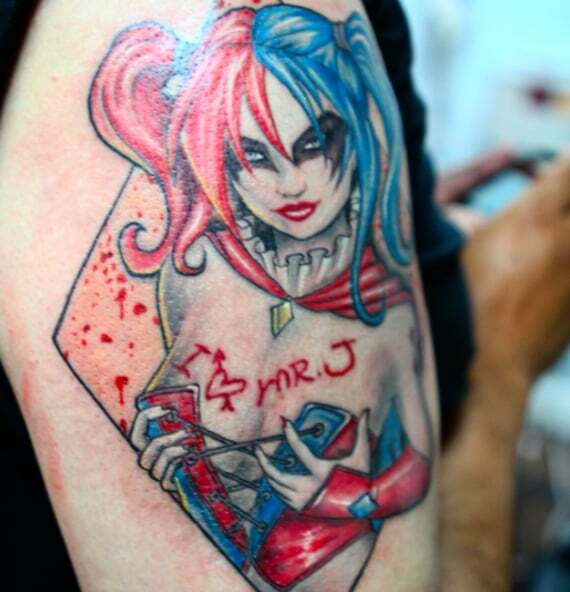 A highly detailed tattoo of Harley Quinn with the Anarchy symbol.